If you love the taste of orange, you'll love this low sugar whole orange cake made with the zest and pulp of 2 entire oranges. The original recipe for this cake is from the wonderful cookbook Bake (Australian Women's Weekly). It calls for 2 whole tangelos that need to be brought to a boil and drained, and that process has to be repeated twice more. The boiled tangelos are then processed whole, rind and all. The first time I made this cake I tried this method (using oranges rather than tangelos), but without the added sugar, the cake was too bitter tasting. I wanted to omit the boiling step, so I removed the zest from 2 oranges, then cut off the rest of the peel and white pith and used only the juicy orange segments that were left. 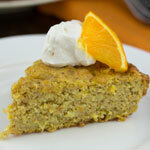 The result was a tangy, orangey, moist cake that I served with dollops of vanilla whipped cream and fresh orange slices. It was a great dessert! Preheat the oven to 350 F. Grease an 8-inch cake pan and set aside. Use a microplane zester to remove the zest from the 2 oranges. Set aside. Cut away the remaining peel and white pith from the oranges and discard. Cut the oranges in half and remove any seeds. Roughly chop the peeled, seeded oranges and process in a blender or food processor until pulpy. In large bowl, beat the butter with an electric mixer until fluffy. With the mixer running, beat in the applesauce, eggs and vanilla extract. Using a spatula, stir in the orange pulp and orange zest, mixing until blended. Add the dry ingredients to the wet, mixing by hand until incorporated. Pour the batter into the prepared pan, smooth the top and bake for 35 - 40 minutes or until a toothpick inserted into the centre of the cake comes out clean. Let cool in pan for 20 minutes. Run knife along edges of pan, place a wire rack over the top of the pan and invert to release the cake onto the rack. Serve with vanilla whipped cream and fresh orange slices, if desired. Drop by spoonfuls onto the top of the cake. If there is leftover cream, add an extra dollop to each cake slice when serving. For a sweeter orange cake, replace the 1/2 cup of unsweetened applesauce in the Mildly Sweet recipe above with 1/4 cup sugar. Adapted from: Whole Tangelo Cake from Bake (Australian Womens Weekly H/B) .